› Author Affiliations Funding The project is supported by Baxter Germany GmbH. The haemophilia treatment centre of the Clinic for Children and Youth Medicine in Jena extends medical care by health-promotion measures, namely: health counselling, adjuvant exercise therapy and school sports. In addition to the regular medical checks at the treatment centre patients are examined regarding physical fitness, joint situation, quality of life in general and disease-specific manner, as well as psycho-social and nutritional behaviour. Findings and medical results of the examinations are integrated into an individual advice on therapy, school sports, and health recommendations. This aimed at strengthening health-related resources and minimizing potential injuries. First long-term evaluation shows an increase of activity behaviour and physical fitness without increasing bleeding rate and maintained joint function. Conclusion: Combining functional prevention diagnostics and individual health counselling shows signs of improved patient’s health knowledge, self-competence and physical fitness. Das Behandlungskonzept am Hämophilie-Behandlungszentrum der Kinder- und Jugendklinik in Jena wurde um gesundheitsförderliche Maßnahmen der Gesundheitsberatung, adjuvanten Bewegungstherapie und des Schulsports erweitert. Begleitend zur turnusmäßigen Untersuchung werden Patienten zusätzlich hinsichtlich körperlicher Leistungs - fähigkeit, aktueller Gelenksituation, allgemeiner und krankheitsspezifischer Lebensqualität sowie psychosozialen Verhaltens untersucht. Ferner wird das Ernährungsverhalten der Patienten erfasst und eine befundbasierte Gesundheitsberatung angeboten. Die Ergebnisse fließen zusammen mit den klinischen Befunden in individuelle Therapie-, Schulsport- und Gesundheitsempfehlungen ein. Eine erste Längsschnittauswertung weist auf eine Zunahme des Aktivitätsverhaltens und der körperlichen Leistungsfähigkeit bei gleichzeitig stabiler Blutungsrate und Erhaltung der Gelenkfunktion hin. Schlussfolgerung: Die Kombination von funktioneller Präventionsdiagnostik und individueller Gesundheitsberatung mit besonderer Förderung des Gesundheitswissens, der Selbstkompetenz und der körperlichen Aktivität haben sich bislang bewährt. 1 Gabriel HW. Leistungsoptimierung in der sportmedizinischen Gesundheitssprechstunde. In: Baumbach-Knopf C, Achatz J, Knoepffler N. editors. Facetten der Ethik. 15. Würzburg: Königshausen & Neumann; 2013: 141-60. 3 Blair SN, Kampert JB, Kohl HW. et al. Influences of cardiorespiratory fitness and other precursors on cardiovascular disease and all-cause mortality in men and women. JAMA 1996; 276: 205-210. 4 Helmrich SP, Ragland DR, Leung RW, Paffenbarger RS. Physical activity and reduced occurrence of non-insulin-dependent diabetes mellitus. N Engl J Med 1991; 325: 147-152. 5 Haskell WL. J.B. Wolffe Memorial Lecture. Health consequences of physical activity: understanding and challenges regarding dose-response. Med Sci Sports Exerc 1994; 26: 649-660. 6 Schoenmakers MA, Gulmans VA, Helders PJ, van den Berg HM. Motor performance and disability in Dutch children with haemophilia: a comparison with their healthy peers. Haemophilia 2001; 07: 293-298. 7 Manco-Johnson MJ, Riske B, Kasper CK. Advances in care of children with hemophilia. Semin Thromb Hemost 2003; 29: 585-594. 8 Dolan G. The challenge of an ageing haemophilic population. Haemophilia 2010; 16 (Suppl. 05) 11-16. 9 Wittmeier K, Mulder K. Enhancing lifestyle for individuals with haemophilia through physical activity and exercise: the role of physiotherapy Haemophilia. 2007; 13 (Suppl. 02) 31-37. 10 Mulder K, Cassis F, Seuser DR. et al. 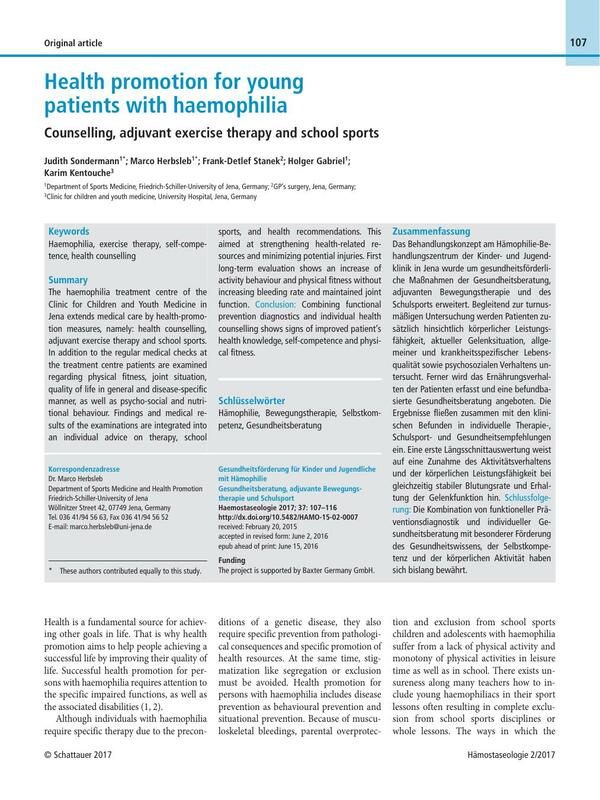 Risks and benefits of sports and fitness activities for people with haemophilia. Haemophilia 2004; 10 (Suppl. 04) 161-163. 11 Engelbert RH, Plantinga M, Van der Net J. et al. Aerobic capacity in children with hemophilia. J Pediatr 2008; 152: 833-838. 12 Egan B, Eldridge B, Barnes C, Wolfe R. Are boys with severe haemophilia as physically active as the normal population?. Haemophilia 2006; 12 (Suppl. 02) 103-106. 13 Van der Net J, Vos RC, Engelbert RH. et al. Physical fitness, functional ability and quality of life in children with severe haemophilia: a pilot study. Haemophilia 2006; 12: 494-499. 14 Falk B, Portal S, Tiktinsky R. et al. Bone properties and muscle strength of young haemophilia patients. Haemophilia 2005; 11: 380-386. 15 Seuser A, Kurme A, Trunz E. et al. Fit for Life – Fitness Levels of Young Hemophiliacs Today. In Scharrer I, Schramm W. editors. 34th Hemophilia Symposium Hamburg 2003. 34. Berlin, Heidelberg: Springer-Verlag; 2005: 232-7. 16 Plachta-Danielzik S, Gehrke MI, Kehden B. et al. Body fat percentiles for German children and adolescents. Obesity facts 2012; 05: 77-90. 17 Kromeyer-Hauschild K, Wabitsch M, Kunze D. et al. Perzentile für den Body-mass- Index für das Kindes-und Jugend-alter unter Heranziehung verschiedener deutscher Stichproben. Monatsschr Kinderheilkd 2001; 149: 807-818. 19 Feldman BM, Funk SM, Bergstrom BM. et al. Validation of a new pediatric joint scoring system from the International Hemophilia Prophylaxis Study Group: Validity of the hemophilia joint health score. Arthritis care & research 2011; 63: 223-230. 20 Hilliard P, Funk S, Zourikian N, Bergstrom BM, Bradley CS, McLimont M. et al. Hemophilia joint health score reliability study. Haemophilia 2006; 12: 518-525. 21 Kohen-Raz R. Application of tetra-ataxiametric posturography in clinical and developmental diagnosis. Percept Mot Skills 1991; 73: 635-656. 22 Hilberg T, Herbsleb M, Gabriel HHW. et al. Proprioception and isometric muscular strength in haemophilic subjects. Haemophilia 2001; 07: 582-588. 23 Krishnamurthy R, Mohanty P, Kumar D, Niranjan S. Bleed frequency, proprioception and isometric muscle strength in haemophilic arthropathy. Haemophilia 2004; 10 (Suppl. 03) 132. 24 Seuser A, Kurme A, Wallny T. et al. How to advise young hemophiliacs to find the right sport?. A new and safe algorithm! Haemophilia 2004; 10: 104. 25 Stephensen D, Winter M. Defects in standing balance in children with severe haemophilia A. Haemophilia 2002; 08: 479. 26 Schwesig R, Lauenroth A, Müller A. et al. Parametrisierung posturaler Subsysteme mit Posturografie. Manuelle Medizin 2006; 44: 376-384. 27 Herbsleb M, Tutzschke R, Czepa D. et al. Isometrische Maximalkraftmessungen der Quadrizepsmuskulatur. Durchfuhrbarkeit und Reliabilitat bei Patienten mit Hamophilie. Hämostaseologie 2010; 30 (Suppl. 01) S97-S103. 29 Ten Harkel AD, Takken T, Van Osch-Gevers M, Helbing WA. Normal values for cardiopulmonary exercise testing in children. Eur J Cardiovasc Prev Rehabil 2011; 18: 48-54. 30 Radoschewski M. Gesundheitsbezogene LebensqualitÄt – Konzepte und Maße. Bundesgesundheitsbl – Gesundheitsforsch – Gesundheitsschutz 2000; 43: 165-!89. 31 Bullinger M. Quality-of-Life – Definition, Conceptualization and Implications – a Methodologists View. Theor Surg 1991; 06: 143-!$8. 32 von Mackensen S, Bullinger M, Haemo-Qo LG. Development and testing of an instrument to assess the Quality of Life of Children with Haemophilia in Europe (Haemo-QoL). Haemophilia 2004; 10 (Suppl. 01) 17-25. 33 Ravens-Sieberer U, Bullinger M. Assessing health-related quality of life in chronically ill children with the German KINDL: first psychometric and content analytical results. Qual Life Res 1998; 07: 399-407. 34 Goodman R. The Strengths and Difficulties Questionnaire: a research note. J Child Psychol Psychiatry 1997; 38: 581-586. 35 Douma-van Riet DC, Engelbert RH, van Genderen FR. et al. Physical fitness in children with haemophilia and the effect of overweight. Haemophilia 2009; 15: 519-527. 36 Bladen M, Main E, Hubert N. et al. Can the Haemophilia Joint Health Score (HJHS) identify differences in joint status in boys with severe haemophilia receiving prophylaxis?. Haemophilia 2010; 16 (Suppl. 04) 113. 37 Saulyte STrakymiene, Ingerslev J, Rageliene L. Utility of the Haemophilia Joint Health Score in study of episodically treated boys with severe haemophilia A and B in Lithuania. Haemophilia 2010; 16: 479-486. 38 Lobelo F, Pate RR, Dowda M. et al. Validity of cardiorespiratory fitness criterion-referenced standards for adolescents. Med Sci Sports Exerc 2009; 41: 1222-1229. 39 Cureton KJ, Warren GL. Criterion-referenced standards for youth health-related fitness tests: a tutorial. Res Q Exerc Sport 1990; 61: 7-19. 40 Blair SN, Clark DB, Cureton KJ, Powell KE. Exercise and fitness in childhood: Implications for a lifetime of health. In: Gisolfi CV, Lamb DL. editors. Perspectives in exercise science and sports medicine: Youth, exercise and sport. Youth, exercise and sport. Indianapolis: Benchmark Press; 1989: 401-22. 41 Broderick CR, Herbert RD, Latimer J. et al. Association between physical activity and risk of bleeding in children with hemophilia. Jama-J Am Med Assoc 2012; 308: 1452-1459.